Well, it's time for another Friends With Flair Friday, and to be honest, I had planned to skip it this time around because this week was so busy, but last night I got a chance to play and I had an idea for this card so I just couldn't resist creating it! 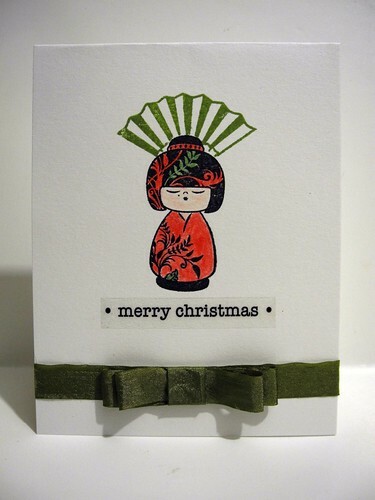 I used the Kokeshi Cuties set by Samantha Walker for Unity for this card. 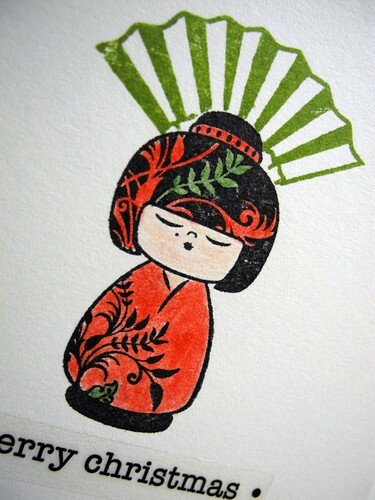 I first stamped the Kokeshi doll and then masked her to stamp the fan behind her head. I LOVE the way that turned out! So fun! She is colored with Prisma Color markers blended with OMS. The sentiment sticker is from SRM Press and the ribbon is, of course, May Arts. And the cuteness...well, that's just from that ADORABLE LITTLE DOLL!!!!! No, really...how can you look at her and not smile? You can't. K. Thanks. Don't forget to check out the following post for my Skipping Stones Feature Friday! What a cute lil Christmas twist! Very cute, love that ribbon bow at the bottom of the card too! Love this image and the card is super cute. This one really is a cutie! How sweet! I love the bow! It's all perfectly adorable and you KNOW you are completely addicted to FWF. I keep telling myself I am going to skip but Unity is so stinkin' much fun! This is adorable, love the sweet oriental image. She's so cute!! Great card!